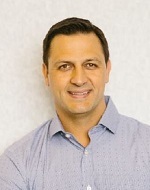 Dr. Loukas Papaconstantinou graduated from the University of Alabama School of Dentistry in 2002. After graduating, he completed a one year surgical internship at Veteran Affairs Hospital. This experience provided a solid foundation for dental surgery. Dr. Papas is a member of the ODA (Ontario Dental Association), TACD (Toronto Academy of Cosmetic Dentistry) and the Asclepius Dental Society. He has taken many continuing education programs in implantology and cosmetic dentistry. He is committed to applying his knowledge and skill to provide the best care for his patients. He has been practicing over ten years with expertise in Veneers, Invisalign, surgical and Restorative Implant Treatment, Surgical Extractions and many other treatments in general dentistry. Loukas and his wife Jeanie have two boys. He loves spending time with his family and friends. In his free time, he also enjoys cooking, playing sports, and travelling. Contact us to schedule a consultation with Dr. Papas.